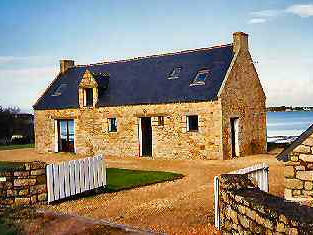 The cottage is situated right beside the beach on the western side of the beautiful Gulf of Morbihan in Southern Brittany, an inland sea dotted with scores of tiny islands and a stunning landscape that is only surpassed by the splendour of the sunsets here. A magical place to simply relax in, swim, windsurf and discover by boat. Locmariaquer itself is an attractive little town scattered along the peninsular with more beaches on the other side that has a thriving oyster farming industry, which you can buy straight from the boats or have in various local restaurants in the area. 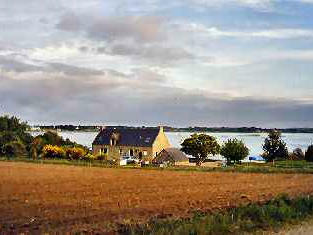 Lorient is 45 minutes from here, Vannes about 25 minutes. 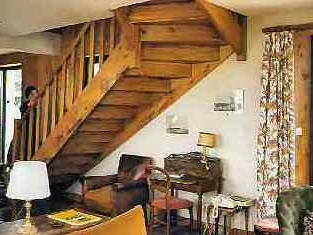 The cottage has been well restored in keeping with its original character and charm and comfortably furnished. The living room and dining room has large picture windows that give a marvellous views of the sea on one side and over the countryside on the other. The kitchen is small but light and well equipped with a dishwasher and washing machine, an oven and hob, microwave and fridge/freezer. There is also a telephone that takes incoming calls. Upstairs are two bedrooms, one double and one twin and a bathroom with a separate wc. There is also a downstairs shower room and a separate wc. Locmariaquer has a variety of water sports facilities and regular boat trips around the gulf and there are others at Trinité, Carnac and St Philibert. The village also has tennis courts that are open to everyone and there is a good golf course in Baden. This whole area has a mass of prehistoric remains, most of which are ignored except for the three most famous ones. One worth searching out is Mané Retual, a dolmen with axes engraved on the massive covering stone, which is held up by some forty supporting pieces. South of the village, towards Kerpenhir, the tumulus of Mané-er-Hroëck yielded a substantial treasure of axe heads and beads when it was opened up. There is also another dolmen on the beach south of Locmariaquer with carvings of shields and boats. The River Auray runs past the historic town of Auray and the pretty port of St Goustan in the valley below it. If you take the road on the east bank of the river via Bono and the neolithic tombs of Kernous and then any of dozens of little roads that lead down to the coastal path along the Gulf of Morbihan, past private gardens sloping down to the water's edge, to watch the sail boats weave around the islands, Brittany doesn't get much more serenely beautiful than this. together with a returnable damage deposit of €400.